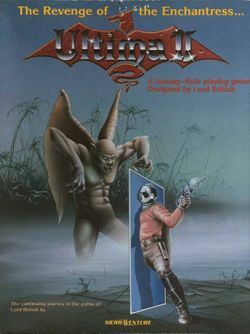 Ultima II: The Revenge of the Enchantress, developed for the Apple II computer and published by Sierra Online on August 24, 1982, is the second computer role-playing game in the Ultima series. It was also the only official Ultima game published by Sierra On-Line. Controversy with Sierra over royalties for the MS-DOS port of this game led the series creator Richard Garriott to start his own company, Origin Systems. The game was inspired by and drew elements from 1981 movie Time Bandits by British director Terry Gilliam. The gameplay is similar to the previous game in the series, Ultima 1. The scope of the game is bigger, in that there are several more places to explore, even though exactly 50% of them are optional and not really needed to complete the game (all the dungeons and towers, as well as most of the solar system planets). A unique characteristic of Ultima 2 is the strong presence of random events: most items can only be obtained randomly from defeated enemies; when raising the character attributes, the specific attribute raised is selected at random; the maximum values of the character attributes are random, too, because the upgrading process has to stop when any one attribute gets higher than 95, or the character will be punished. In the game, the player has to travel to five different time periods of Earth, using time doors. The periods are: Pangea age (about 300 to 250 million years ago), 1423 B.C. ("before the dawn of civilization"), 1990 A.D., the 2112 A.D. aftermath, and the Time of Legends (a timeless period). In 2112 A.D., the player also has to travel to space, where he can visit all the planets in the solar system. You start your quest lost and alone with only your wits to defend and guide you. Don't despair! Before long, you'll have people standing in line to meet you!!! Pick up some useful tips in a local bar. Hobnobbing with royalty is expensive, but you'll receive something you need. You'll travel the high seas in search of adventure, but watch out for those pesky sea serpents!! Dungeons and towers are dark and scary places, but the treasures they hold must be obtained to get further on your mission!! In time you will leave earth and travel to other planets in our solar system. Be sure to pack for a night away from home. When you return you must be prepared to face the ultimate challenge, to destroy the evil enchantress who has enslaved the entire universe: Minax!! ↑ The original text had no verb in the sentence, but just a preposition. ↑ The original text uses the French verb "voyage" intead of the English verb "travel". From the game's manual, we learn that the lover of the dark wizard Mondain, the enchantress Minax, is threatening Earth through disturbances in the space-time continuum. The player must guide a hero through time and the solar system in order to defeat her evil plot. The young Minax survived her mentor's and lover's death at the hands of the Stranger (in Ultima I) and went into hiding. Several years later, Minax got older and very powerful, more than Mondain once was. Minax wanted to avenge the death of her lover, so she used the time doors created by Mondain's defeat to travel to the Time of Legends, a place located at the origin of times. From there, she sent her evil minions to all the different time eras; she also used her dark powers to disturb the fabric of time and influence men, who ultimately destroyed each other in the far future, nearly wiping out humanity. When Minax minions emerged from the Time of Legend into the present of Sosaria, Lord British called for a hero to crush Minax's evil plans. The Stranger once again answered British's call. The game begins with the Stranger starting his quest to defeat Minax. Minax's castle, named Shadowguard, can only be reached through time doors (similar to moongates in the later games); even then an enchanted ring is required to pass through the force fields inside. The war against Minax's vile legions is long and hard, but eventually the hero hunts down the sorceress to the Time of Legends, pursues her as she teleports throughout the castle, and destroys her with the quicksword Enilno. 1982 Apple II The very first version of Ultima 2 was programmed on and released for the Apple II. The game was bigger than its predecessor, but graphically it didn't improve much, which isn't that bad, considering the time it was released. 1983 Atari 8-bit The gameplay is the same, but the graphics are even worse than on Apple II. 1983 DOS The graphics are the first big problem with this version. Nevertheless, 4-color CGA graphics were standard in 1983, so the programmers can't be blamed. The second problem is the speed: it's too fast for modern computers, making the use of a slowdown-utility a must. 1983 Commodore 64 A very good 8-bit version. The graphics are superior even to the Atari ST and playability is very high. 1985 Atari ST This version is different, at least when it comes to controls: it's fully controlled by the mouse and commands are chosen over a menu on the top of the screen. Some people might say that keyboard control might be faster when you are used to it. The other point that is striking are the graphics. In contrast to many 8-bit versions and the original Apple II version, they used bright colors. Where once was black, there now is white, giving it a complete different look. 1985 Macintosh The controls (via mouse and menus) are similar to those in the Atari ST version. This version is in black & white, as most of the early Macintosh games. NEC PC-9801 This early release by the Japanese company Starcraft resembles the western homecomputer versions, with the exception of being translated in Japanese language, obviously. NEC PC-9801 Pony Canyon released this remake of Ultima 2 in Japan only. They improved the graphics and sound, making it a very good version (albeit playable only if you can read Japanese). Since the PC-9801 is more powerful than the MSX-2, the former is probably the best Ultima 2 version to date. The Japanese-only version included in Ultima Trilogy (FM Towns) has two important changes to gameplay: (1) visiting dungeons is now necessary, because one vital item is no more dropped by defeated enemies; (2) understanding of Time Gates becomes more prominent, because traveling by ship is limited by the availability of another item. A fan-made patch for the Apple II version adds these changes to the game. The attributes of the character are not supposed to be raised to their maximum. If the player tries to, any attribute that gets to 99 is reset to zero. Therefore, most players feel that the game is affected by what was called the "roll-over bug". A fan-made patch for the DOS version changes this, improves graphics, and adds more functionalities (part of which were already available in the C64 port). It can be downloaded here: exodus.voyd.net. This page was last edited on 21 September 2017, at 11:31.